Once again, Vikram picked up Betal and put him on his shoulder. Betal began a story. There was a rich man called Dhanilal. his relative, Chandu, lived with him. Chandu was young but lazy. One afternoon when he was sleeping, he dreamt that he was a rich man and Dhanilal his servant. In his sleep he spoke, "Dhanilal, you are my servant, come here." Dhanilal, who was nearby, heard this. He got very angry and threw Chandu out of the house. 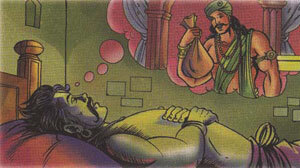 Chandu then went to a sage and asked him to make him rich. The sage gave him a mantra and said, "Whenever you dream of something, if you want it to become true, chant this mantra." Chandu was happy ; he went to sleep. He dreamt that Dhanilal was saying sorry and wanted Chandu to marry his daughter. Chandu woke and chanted the mantra. At once, his dream came true. Chandu became Dhanilal's son-in-law and started living in his house. Dhanilal gave Chandu some money with which he started a business. One night he dreamt that he had become a rich businessman. He woke up and chanted the mantra. His business flourished and he earned a lot of wealth. But the other businessman did not respect him. One day Chandu dreamt that he had become king. When he woke he didn't chant the mantra. He went to the saint and gave back his boon. Betal asked , "Why did he do that?" Vikram replied, "Chandu had realised that without hard work he could earn money but not the respect of others." Betal said, "You are right, but you spoke , so here I go."